The EPBF (European Pocket Billiard Federation) was recently informed by its member, the German Billiard Union (DBU) that they regrettably have to withdraw a player from the team. The player withdrawn is Germany’s rising star, Joshua Filler. In his place, comes a strong young competitor from Poland, Patryk Statkiewicz who lost in the final of the 9-ball to his now teammate, Raphael Wahl. Poland has a good young crop of players, they are known for producing great talent and Patryk will add a lot to this team with his inclusion. Team Europe will meet team USA in what will be a fabulous event full of action and drama. These two great Continents going head to head over a four day bonanza, starting on the 1st of July. It’s a team match-up over a possible race of 21. The team winning 11 matches will be crowned Atlantic Challenge Cup Champions come Saturday the 4th of July. 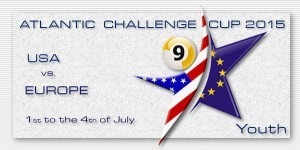 The Atlantic Challenge Cup is organized by the EPBF and its partner IBPF in conjunction with the BCA & BEF and will be staged each year between the two Continents.